2. Product Desription:HEPA (High Efficiency Particulate Air) for the dust which is more than 0.3 micron, the filtration efficiency can be as high as 99.97%, is a good air purification product. HEPA can be divided into three materials: PP filter paper, glass fiber and composite PP + PET filter paper, and it can be made into a variety of shapes according to customer requirements. Features:low wind resistance, high dust holding capacity, high filtration precision, and it can be processed into various sizes and shapes according to customer needs, and suitable for different models. Combine the HEPA and active carbon honeycomb together, it not only has the filter function to remove dust and pollen, but also has the function of removal of formaldehyde, ammonia, toluene, trimethylamine and smell of cigarettes and other harmful gases. 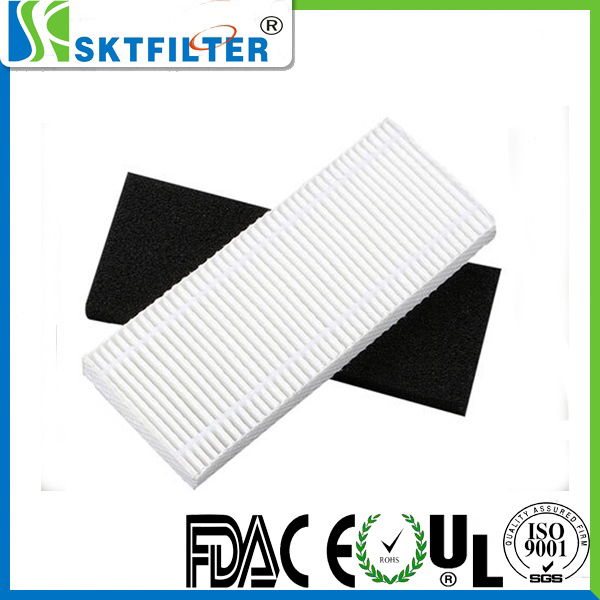 Combine the HEPA and Nano silver sponge primary efficiency mesh together, it cannot only remove the dust and pollen filter, but also can inhibit and kill Staphylococcus aureus, E. coli and other harmful bacteria.